When you’re trying to decide what driving lights to get, it’s easy to feel like you’re flailing around in the dark — mainly because you don’t have any lights yet! But also, there are a multitude of intricate technicalities that can make choosing the right light for your purposes a tricky task. 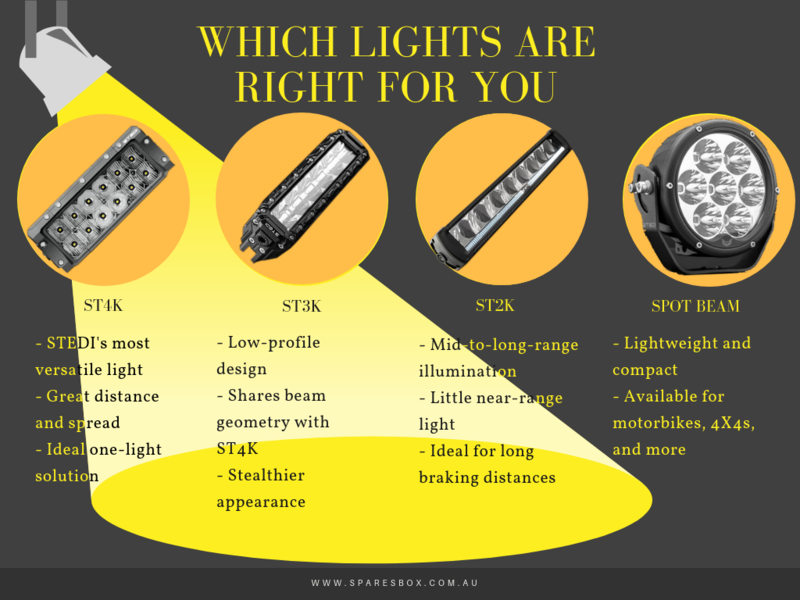 That’s why we at Sparesbox have put together this handy guide to help you work out which STEDI lights should be affixed to your trusty vehicle. When choosing an appropriate STEDI Driving Light, the main thing to keep in mind is that the deciding factor does not lie within the light itself, but rather in the style of driving you for which you intend to use it. Powering up and over sand dunes in the dead of night calls for a very different driving light than a simple trek along dusty country roads. Every STEDI Driving Light creates its own unique beam shape and profile, making them suited for a huge range of purposes. The key to picking the right light for you is to know which type of beam is best suited to your driving style and the kinds of environments and conditions you most frequently drive in. The STEDI ST4K is the most versatile of all the light bars in STEDI’s expansive catalogue, producing a relentlessly brilliant beam that excels in both distance and spread. The technology at the foundation of the ST4K Series is the same powerful tech employed in the popular Type-X Spot Lights. The combination of powerful illumination, incredible distance, and generous spread makes this the natural choice for any driver searching for a single-light solution. 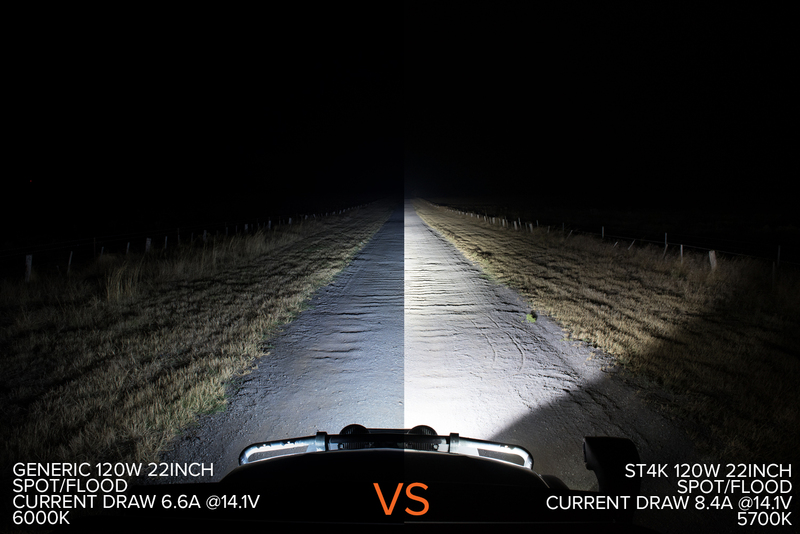 The major selling point of the ST3K LED light bar is its unique low-profile design while still offering the same beam geometry as the beloved ST4K Series. The powerful light bar is ideal for applications where a low-profile setup is called for, or for drivers who prefer a subtler aesthetic on their vehicle. The STEDI ST2K Light Bar is a unique item even among STEDI’s already innovative and singular catalogue. This light is designed specifically for drivers who want superior mid-to-long-range illumination while also producing very little near-range light. The incredible amount of light this model produces between 150 and 200m makes it an ideal accessory for high-speed vehicles and applications that require extra preparedness or long braking distances. STEDI’s range of spot lights is focused on providing a lightweight, mountable solution to your lighting needs. Whether you’re a motorcyclist who loves exploring off the beaten track or an off-road aficionado, STEDI’s simple yet powerful spotlights are a great way to light the darkness out in front of you.